I mean, not only was it solid food, but I was still just at the beginning of my healing. I still was dealing with cravings, especially for my beloved nuts. Which as you know, I have since cut out until I heal the whole psychology aspect of my GAPS, as I discuss here. As of this posting, I have actually gone almost 4 weeks without nuts and I am not incredibly anxious to get back to them like I was before. I truly am healing. 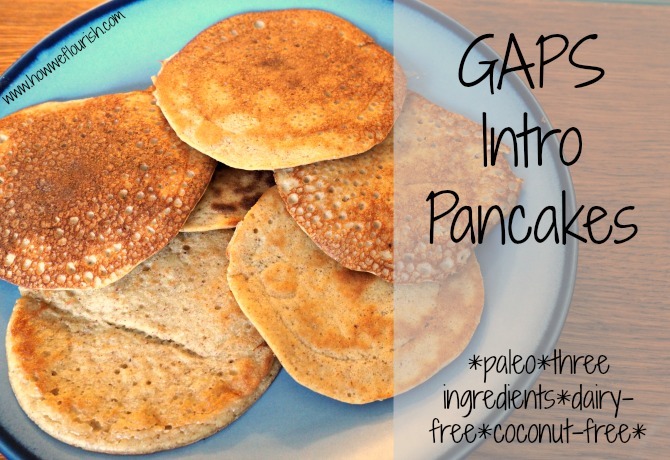 But that doesn’t mean that the GAPS Intro pancakes aren’t an amazing addition to the diet. They are a non-soup food, they taste amazing, they can be transported easily, and they are quite nourishing if you can tolerate nuts. At that point in Intro, they are a huge quality of life food. As I prepared to make these delicious GAPS Intro pancakes, I realized…I couldn’t find a recipe. Gut and Psychology Syndrome didn’t give proportions. What Can I Eat Now didn’t include nuts in one, and used ground nuts (as opposed to nut butter, like Dr. Natasha recommends) in another. Searching the internet, I was surprised to find there wasn’t really anything available. *side note* Throughout this whole process I have been surprised by how few resources are available considering how many Intro journals can be found. One of my goals is to help fill this gap (no pun intended). I found a recipe that only uses yolks (note that cinnamon should not be used until Stage 6), which is great if you can’t tolerate the whites. But I wanted to use whites. I do tolerate them, so I don’t want to waste them. I found this recipe that calls for whipping the whites, which I bet makes amazing pancakes. But I need to keep GAPS Intro sustainable for me. I keep things easy. I’m the girl who would batch cook two soups a week and only eat those because it was the least amount of work. I wanted to keep it simple, so I created my own GAPS Intro pancake recipe: 3 ingredients, no complicated preparations, pure deliciousness. Although easy, cooking these GAPS Intro Pancakes is a great exercise in patience. They need to be cooked slowly over low heat. This will ensure they are fully cooked with a good texture and without burning them. Cooking with a generous amount of fat will also help with this. The good news is that since they are so small, you can fit multiple pancakes in your cast iron pan (the one below is a size 6). And when you flip the pancakes, the bottom will be slightly golden. I noticed that the more fat I use, they less they brown. Don’t worry if they don’t look like traditional browned pancakes – they will still taste wonderful. If you cook on low heat until both sides are golden, you can be sure they the pancakes are cooked all the way through. They are delicious with extra fat added, or even extra almond butter. If you can tolerate sugar or fruit, honey or some berries would also be lovely. Paired with soft boiled eggs and a mug of broth, these pancakes make a perfect GAPS Intro meal. 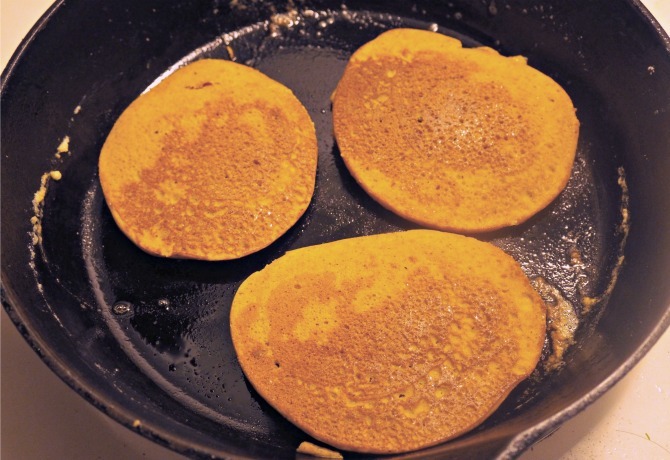 Note: A serving is 2-3 of these pancakes, paired with healthy fats, proteins, and broth. A single pancake has about 1 tsp of almond butter in it, making it the perfect size for testing almond butter when you are in Stage 3 of Intro. These pancakes store/freeze really well. Make a large batch to eat throughout the week or save for later. Simple heat them back up with some fat in a cast iron pan. Warm a cast iron pan on low heat. Melt a generous amount of fat and make sure that the pan warms back up. Place cooked squash and almond butter in a food processor. Process until well combined. Add eggs. Pulse to combine. When the pan and fat are warm, spoon a small amount of batter into the pan - about 2-3 spoonfuls. Cook until top firms up a bit and bottom is golden. Be patient. Serve with extra fat and honey (if tolerated). You can probably use any kind that mashes well. I’ve made these with acorn and butternut – both turned out very good. great! thank you! I hadn’t seen your reply so those are the 2 I picked up last night! Just finished cooking them, figured I’d try a batch of each! And pumpkin. I’ve used pumpkin, too. “I keep things easy. I’m the girl who would batch cook two soups a week and only eat those because it was the least amount of work.” <—- Yes, exactly! I batch cook also and am perfectly happy eating the same thing every day for a week, lucky me 🙂 I also saw the recipe with whipped egg whites and immediately thought, "Hmmm how bout a recipe without extra steps?!" I removed eggs a month ago after feeling like they made me congested. Just tried a yolk today, so we'll see how it goes. Maybe I'll be making pancakes next week. Fingers crossed! Thanks so much for this post! Good luck with your egg yolk! I hope you can try these pancakes soon! I think my girls would love the taste of these! Great idea! I love pancakes. These sound yummy. I’m a student wanting to try GAPS and do you think 240$ / month is enough money for food in the diet? It depends on where you live, but it should be. It’s all about prioritizing. My husband and I spend less than $400/month for two people on exclusively high quality animal products and quite a few organic vegetables. However, we live in the Midwest and only eat the more frugal cuts of meat (ground beef, whole chicken, soup bones) and vegetables (onions, broccoli, carrots, etc.). These look great, so yummy! I pinned! 🙂 Go GAPS! So simple yet so nourishing. Thanks for sharing Chloe! I can attest that these taste as good as they look. Great photos! 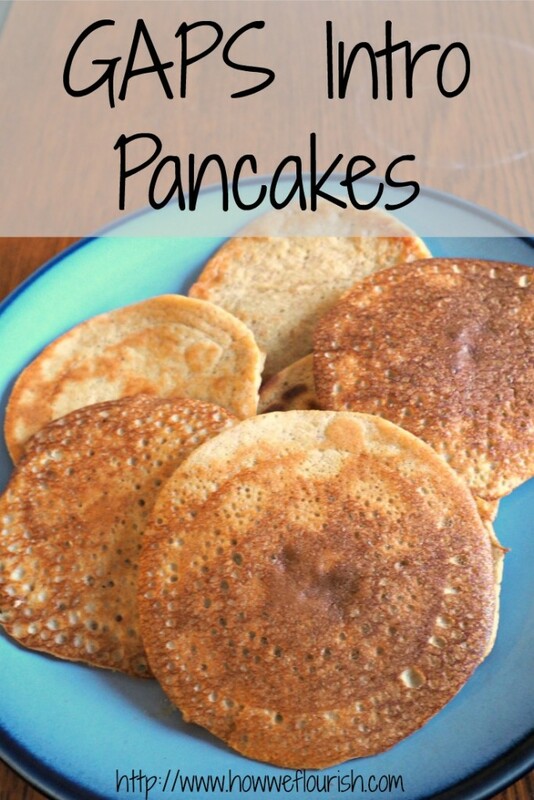 My kids love all kind of pancakes, we will be trying these. How stinking creative and nourishing. I love this recipe. 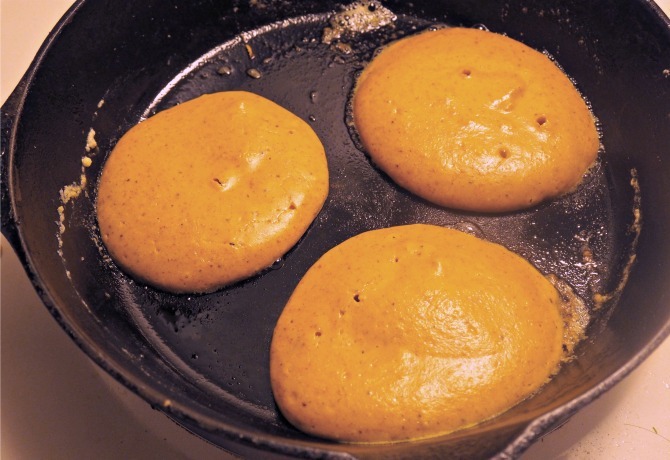 Squash pancakes…I’m so intrigued. I’ll have to give these a whirl. Yet another fantastic recipe, Chloe. Thanks for sharing! Oh…and I love seeing you cook them in your cast iron. Hooray! Thanks so much! I was very intrigued by the idea, too, and they turned out so good! We love our cast iron. It is really well seasoned, so we cook whatever we can in it! This looks great! And a great first food for my one year old! 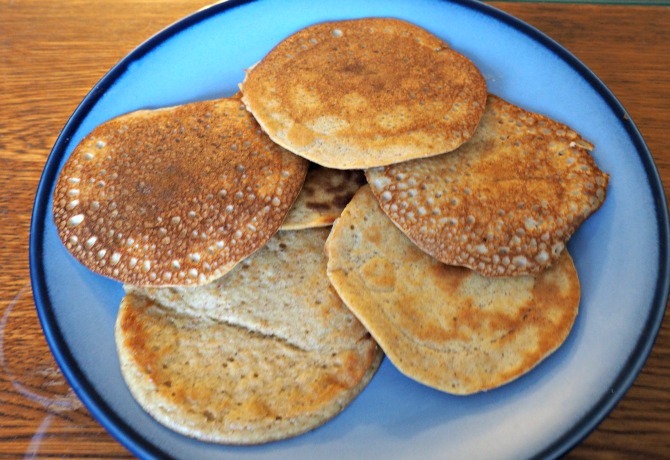 We’re not on GAPS, but these still look like a great way to healthy up our weekend pancakes!!!! THANKS! Thank you! They definitely are a very healthy version, and I’m sure anyone would love them, whatever type of diet they eat. When my daughter was on GAPS we did something similar – she ate them up! They are so filling, and feel like a real treat. Yes! One day I tried to have 2 eggs and 3 small pancakes for breakfast and I was so full afterwards! They really are wonderful. Featuring your recipe this week, thanks for sharing it on Allergy Free Wednesday! I love the squash in these…i LOVE squash! Seriously! the amount of information given out there is ridiculous! It’s so hard to find anything that can actually be used. I’m on the 3rd week of soups now too. My pancakes turned out like omelets with squash and almond. is that accurate? 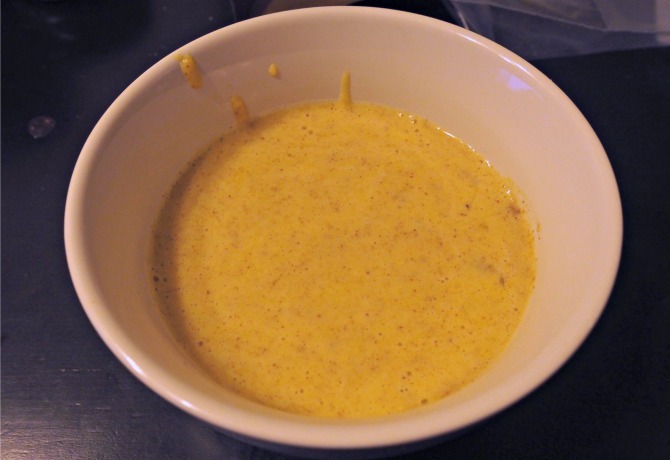 Although, right after I made them I felt like I wasn’t exactly ready to leave the soup yet…. I got terrified and shoved myself right back into my soup laden shell! Thank you. I just found you. I’ll keep looking through your stuff. My pancakes actually turned out rather pancake-y. I hate pancakes or baked anything that is eggy, and I had no issue with these pancakes. But I also didn’t eat them much. I did much better with lots and lots of soup! How do you cook the squash? Bake it in the oven or steam it? Thanks! I usually just bake it in the oven. I bake it whole to keep it more GAPS-friendly. You could also cut it in half and bake the halves face down on a baking sheet with a little bit of water in it. Is this okay to eat every day on the gaps diet? If you tolerate them well in that quantity, yes. Patience indeed! I think I didn’t wait for the pan to be fully heated, and didn’t wait long enough to flip – total fail! What a mess! The second time around, they came out great! Thank you! I am not doing GAPS or anything but I really enjoyed these for my daughter’s snack! Thank you for the recipe! Would it work making these with the egg yolk only as I can’t tolerate whites at the moment? I have never tried that myself. They may not hold together as well, but it is certainly worth trying. I tried it with just the yolk and they turned out fine. I have been fine with raw egg yolk in my soups, but not the whole eggs. 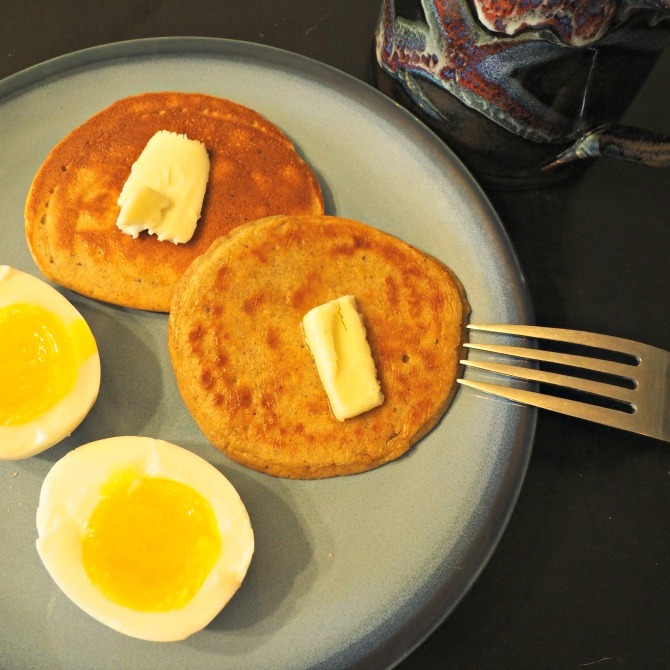 Hi – I recently made these with summer squash, homemade almond butter and the eggs, and they would not turn over easily! They kept sticking to the cast iron pan even though I had generously covered it with coconut oil. Any suggestions? Exactly what are you calling squash? The small yellow funny shaped vegetable or more like a pumpkin or a spaghetti squash? I usually use butternut squash, but have successfully made them with a variety of winter squashes. Is it necessary to dry out the soaked nuts before making the nut butter if I’m just going to use the nut butter to make pancakes? I too am interested in the question about summer squash. Planning on using zucchini as winter squash is not in season. I don’t think it is. I know some people do not dry their nuts before making nut butter. However, I have never tried that myself. your hyper link on homemade almond butter is no longer working. Just noticed as I was trying to figure out how to make almond butter. Thanks for the recipe I am excited to try it out! If I can only tolerate egg yolks. How many do you think I would use? Can I substitute this with egg yolks? How many do you think? I’m not on Gaps but gluten intolerant, thought I would give these a try as they looked so simple. Came out really well and as they are so quick to make they will be great for all those occasions you need something kind of bread like, three ingredients in a food processor brilliant!